Sonic Welded Boxes are virtually limitless in configuration and decoration! 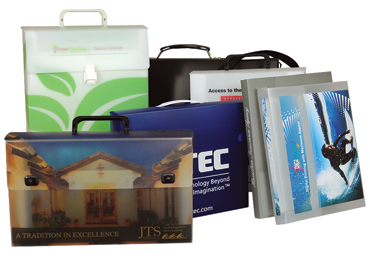 With excellent durability and multiple customization options, polyethylene and polypropylene boxes have been used by small industry and major corporations for a number of uses including marketing/advertising, promotional, sample kits, product guides, training kits, and conference materials. Also available in tuck tab construction - ships flat to save on shipping cost! These boxes can be beautifully decorated using screen or offset printing. A custom sonic welded box will clearly communicate your message while protecting and presenting your products image beautifully. With virtually any idea you want to present, we will work hard to manufacture to your exact specifications and provide an economical and durable solution. Call 1-877-749-2127 to speak to a PackZen Representative!